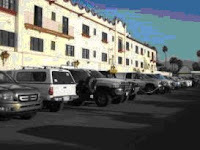 11.18.09 When I heard that an exploratory trip to Baja was being considered, I was curious to learn more. My experience of race cars away from the safe home of ovals and roads courses was limited, but not completely missing. Many, many years ago, I had been in a chase car, driving hard through Welsh forests, Yorkshire dales and Scottish mountains during what was then the RAC Rally. Following that, a season’s worth of crewing on a tarmac rally car rounded out my off-road experience. However, none of that would prepare me for Baja and Mexico…. The idea was to join up with the Honda Ridgeline Team, a low-key, American Honda-funded program that had been running for about four years out of Anaheim Hills, Calif. and operated by Clive and Gavin Skilton (a father / son team). Despite the low-key and low budget; the team had been remarkably successful, and would go to the Baja 1000 as defending class champions. In a very short time, we managed to talk AHM into giving us a Ridgeline truck – which had formerly been used as a press vehicle – for the trip, then found hotel rooms right at the starting line and been in touch with the Honda guys who would assign us to what was now "Chase [support vehicle] 4!" Matt, Allen and I left HPD at lunchtime on the Wednesday prior to the race start on Friday. The tentative plan was to collect our ‘chase vehicle’ from AHM Public Relations in Torrance, and rendezvous with Gary and John from AHM either in Long Beach, or just on the USA side of the border crossing to Mexico. As promised, our truck was waiting for us; with just under 5,000 miles on the clock, clean and in good shape. We were then informed that the truck was "going to the crusher" as soon as it got back….did we really need that Mexican insurance? All sorts of moneymaking ideas were popping into our heads once those words were instilled! Matt, a veteran of several previous Bajas and a buggy owner himself, was prepared; tools, jacks, hardware, deck chairs, and toilet paper filled the bed of his own truck, and all of it was soon transferred to the Ridgeline. With our own cars safely secured at AHM’s long-term parking lot, we were quickly loaded up, fueled at the on-site filling station – passing two grinning AHM employees who were evaluating a Lexus IS-F (if only we made a competitor to it…) – and heading down the 405 towards San Diego. This was my first time in a Ridgeline, and from the comfort of the back seat, I was extremely impressed; I found it very unlike any other pickup truck I have ridden in – the ride in the back was very comfortable …"This might not be too bad a place to spend the next few days," I thought…but more on that later! Off to Mexico. . . Reaching San Diego was an uneventful experience, until we arrived at the border-crossing area, where a mixup in directions had us driving in circles, trying to locate the other AHM truck. I guess being told to turn left off the freeway can be confusing, especially when there are two freeways running parallel to each other – I mean, how many McDonald’s car parks can there be? The first casualty of the trip happened right there at McDonald’s. In trying to feed the radio antenna cable under the seat, Matt managed to slash his finger wide open; blood was dripping everywhere…nice! Inspection revealed a razor-sharp edge on part of the seat frame; leading to some choice words about those responsible for seat design! The other Ridgeline was loaded to the gunnels with spare wheels, fuel cans, spare parts etc., and very obviously riding on the bump stops. Crossing the border was an uneventful process; I was concerned about getting back in, being a non-US citizen, so I opted to stop and get a visa; it turns out that for a seven-day visit, there is no charge. Duly stamped and with darkness upon us, we crossed over into Mexico and the border town of Tijuana. The run to Ensenada was uneventful and to be honest, not very exciting in the dark. Fortunately, with Matt having been down that way several times in the past and the other guys in the leading Ridgeline knowing exactly where we were going, finding the hotel was a breeze. And a great location, it turns out; right by the harbor and the collection area for the pre-race scrutineering. Parking, though, was another matter. It seems that when you book the hotel room, you also have to reserve the parking. Fortunately, the Skiltons are past masters at this, and two spots were waiting for us, although you could have only squeezed a cigarette paper between the cars once they were parked! The whole crew was waiting for our arrival, and a mixed bunch they were…the biggest thing to appreciate is that they were all volunteers, doing this for beer money and a t-shirt. And that, as I came to learn, is really the spirit of the race. The Skiltons, it turns out, are English. Clive is from a small town just a few miles from where I was living prior to emigrating to the US. The crew consisted of three AHM employees (John, Gary and Vlad), a schoolteacher (Ed), a fabricator (Kevin), a surfer (Scott) and one other person (Noel). I never knew what he did! We spent that evening getting to know each other in a backstreet seafood restaurant – swapping stories of IndyCar and ALMS racing with those more relevant to the next few days of off-road racing. It appeared that both Allen and I would have a lot to learn! The evening wasn’t over until we paid a visit to one of the local bars, and as we were in Ensenada; there was only one option, Cantina Hussong’s; the oldest cantina in the Californias and home of the original Margarita! Two dollars a beer is a far cry from the prices in L.A.! And so, to bed at the end of Day One.